Yesterday morning, I noticed that there was a new Facebook friend request in my inbox. Clicking on the tab to check who it was, I realised that it was sent by my close friend from university. Finding it a bit odd (though not completely implausible), I wondered why she created a new Facebook profile when she already had another – filled with years of photos and memories. But there was a nagging feeling that the situation wasn’t as simple as it seemed. And it was when I checked her new profile that I knew something fishy was up. Her profile photo was exactly the same as the one she had on her older account. If she was truly creating a new profile, perhaps to separate her work and personal contacts, why would she use the same photo? There was nothing on the profile, other than her profile photo and friends list. Her old profile was still running and very active. A mutual friend’s boyfriend, who was also added to the new account, had also received Facebook messages from my ‘friend’ asking for his phone number. We quickly got into action, and reported the account. Her post wasn’t the first of its kind that I’ve seen. 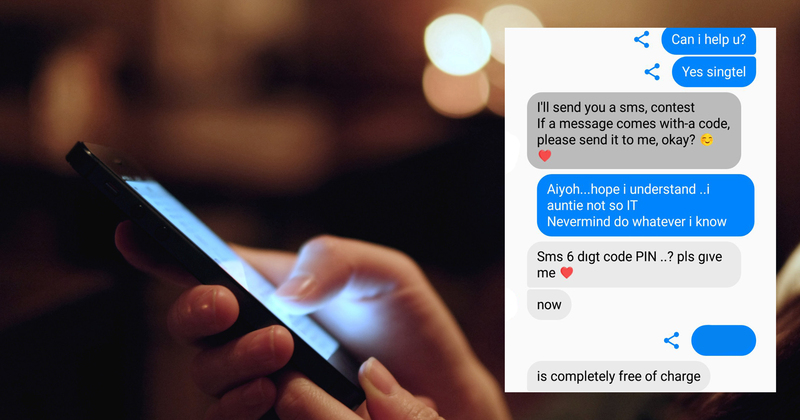 Over the past few weeks, different Facebook friends have come out with their experiences on how they, too, were impersonated by scammers that were Facebook messaging their friends, asking for personal details like their phone numbers and OTPs (one time passwords). Yesterday, my mum was also targeted by the same scam. Except in her case, the scammer got his/her way. 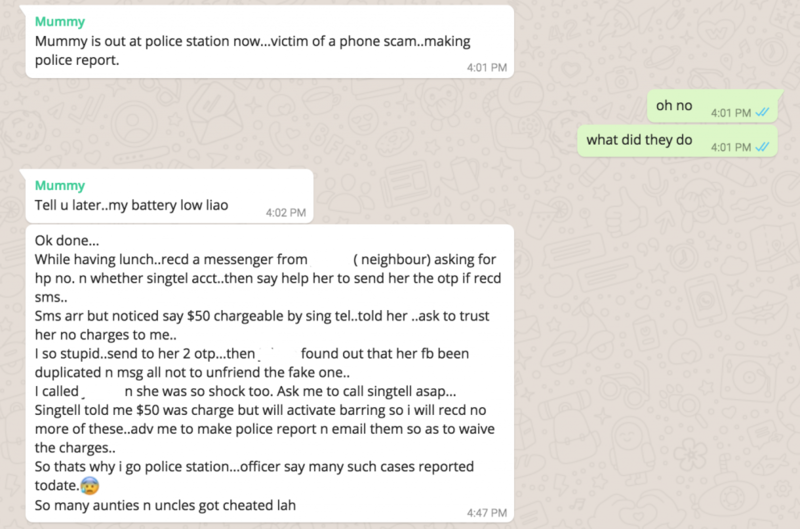 Singtel told me that $50 was charged, but they will activate barring so I will receive no more of these […] So that’s why I went to the police station. The officer said that there are many such cases reported to date. I immediately asked for the screenshots from the convo, and the modus operandi is exactly like how it is in all the other cases. After finding out your phone number, they will then charge various amounts to your account, asking you for the OTP to verify the payments for things like gift cards or gaming credits. If you’re lucky, you’d realise that something is fishy before the scammer gets away with too much. Fortunately for my mum, the amount was just $50, and she managed to contact Singtel and the Police in time. Aiyoh…hope I understand…I auntie not so IT. The situation is a glaring example of how technology, while easily accessible to all, might leave some pockets of users behind. 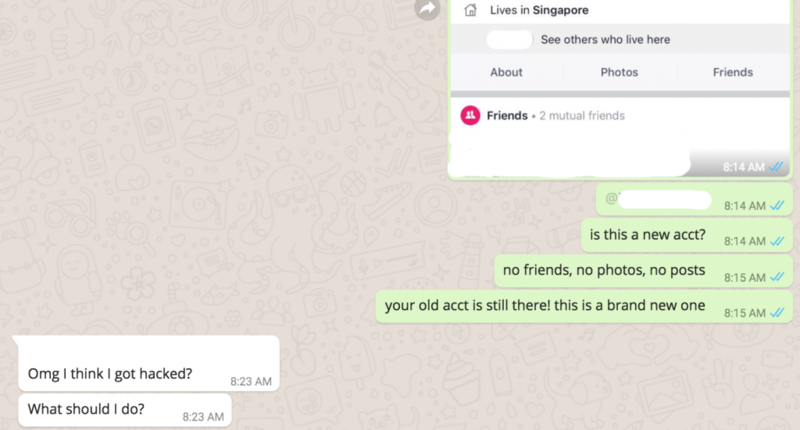 For those like my mum, while they’re savvy with using platforms like Facebook to communicate and post photos, they might not be equally savvy about how scammers are operating these days. Personally, I felt bad about not warning my mum in the first place, but just like every other scam, most people don’t know until they get burnt. This ‘Facebook friend’ scam will eventually die down when scammers realise that people aren’t falling for their tricks, but more sneaky methods would pop up soon enough. While adopting a constant state of distrust isn’t the way to go, it might be better to just remind friends and family to always be vigilant and hold their personal information even closer to themselves.